DESIGNED FOR THE NEWEST EDITION OF YOUR FAVORITE ROLEPLAYING GAME! Adventurers possess phenomenal skills and powers, though it proves difficult to keep track of each feature or when they are once again available. 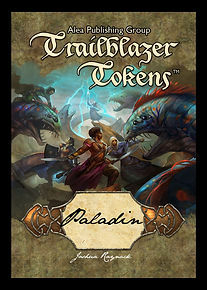 Trailblazer Tokens™ provide a simple, yet effective method of organizing which features you expended and which are still at hand. When a feature remains available, keep it face up. When you expend a class feature, flip the card face down or set it aside in a stack. Each card provides a subtle reminder of the benefit of the feature and when it will refresh. All US poker-size cards are made from premium Arjo-Wiggins card stock. Note: This product contains OGL references.